Last night, Disney held its big animation panel, which included all the new upcoming releases from Pixar as well. Host John Lasseter presented an in-depth look at the animation studios' slate and unveiled never-before-seen footage from upcoming releases. From Walt Disney Animation Studios and Dark Sky, Olaf's Frozen Adventure, Frozen 2, and Wreck-It-Ralph 2: Ralph Breaks the Internet were all accounted for. From Pixar Animation Studios, Incredibles 2, Toy Story 4, and Coco made the cut. The event included surprise announcements, musical performances, and appearances by the films' star voice talent and filmmakers. The D23 Expo Disney and Pixar Animation Panel kicked off today in an explosive fashion that included the announcement of a new untitled Pixar project directed by Dan Scanlon. John Lasseter, chief creative officer of Pixar and Walt Disney Animation Studios, teamed up with Scanlon to deliver the news to an eager crowd awaiting any kind of news regarding the next major Pixar movie. The announcement comes after Pixar's Cars 3 has been in theaters for a month, gaining a creative victory lap thanks to fans and critics who have praised the movie for it's stunning visuals and compelling story. 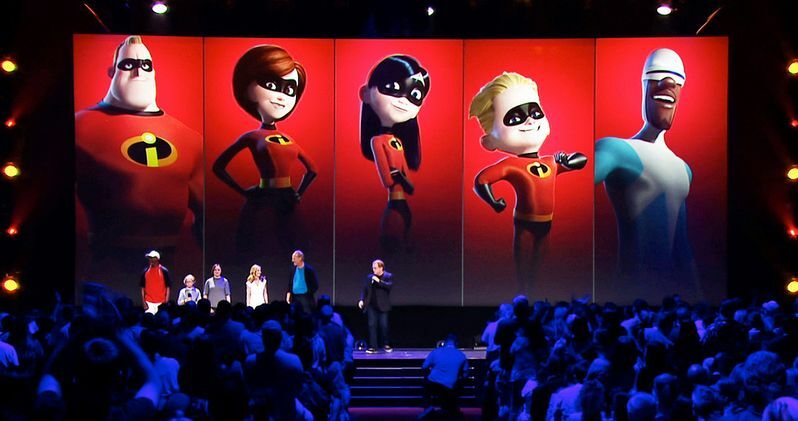 Lasseter and Scanlon made the official announcement at the D23 Expo earlier today during the Animation Panel. Director Dan Scanlon, who helmed Pixar's Monsters University, joined Lasseter to share a few details about an all-new original feature film currently in production at Pixar Animation Studios. According to Scanlon, who lost his father at a very young age, the film is inspired by the question he's always asked: Who was my father? The story is set in a world with no humans, only elves, trolls and sprites, anything that would be on the side of a van in the '70s. Says the director. "In the film, we're going to tell the story of two teenage elf brothers whose father died when they were too young to remember him. But thanks to the little magic still left in the world, the boys embark on a quest that will allow them a chance to spend one last magical day with their father." Lasseter introduced the untitled project by saying, "We love taking audiences to new worlds they've never seen before. The untitled Pixar film that takes you to a suburban fantasy world." Before unveiling some quick clips to the crowd. Scanlon added that the untitled movie is a, "Mixture of the fantastic and the everyday." The brief clips revealed mushroom homes with satellite dishes attached to their roofs and the image of majestic unicorns digging through the garbage like a raccoon or possum and it really looks awesome as only Pixar can deliver. The untitled project is not the only movie that Pixar has in development at the moment as Coco, The Incredibles 2, and Toy Story 4 were all announced today along with 2 more untitled projects. All of the upcoming movies are in various stages of development, all the way from polished and almost ready to go to test footage of two jets flying into space. Scanlon's untitled project does not have an official release date set yet, but expect that news to pop up soon. Pixar has created some of the most emotionally realistic movies for all ages and Monsters University definitely fits into that mold. So it will be interesting to see where Scanlon goes with the personal project, but one thing is certain is that the movie will pack an emotional punch. If you weren't able to attend the D23 Expo, you can check the best highlights from this entire presentation here. Captain America Goes Full Nomad in Infinity War?